Safely display a variety of your products on your slatwall or slatwall display! Chrome slatwall safety hooks are a handy slatwall accessory. These are great for keeping your customers safe with no pointy ends. The hook thickness is .228 in. Add a security lanyard to keep your product safe. Lanyard, item 8368 sold separately. 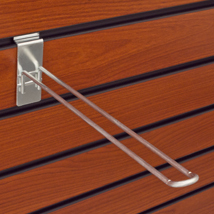 For more offerings, we ask you to take a moment to go through our entire assortment of peg hooks for slatwall at Specialty Store Services now.